Ro-Ri San has been travelling quite a bit lately. His most recent business trip took him to Italy. He managed to squeeze a weekend to Rome into his tight schedule. I wish I could have joined him but school is still in session for Ro-Jiro. Perhaps I can do that next time. This time I asked for pasta and he brought home an interesting variety which I will be sharing in the days ahead. He also surprised me with a few packets of bread and pasta seasonings and a beautiful bottle of balsamic vinegar. I was thrilled and cannot wait to put all the ingredients to good use. 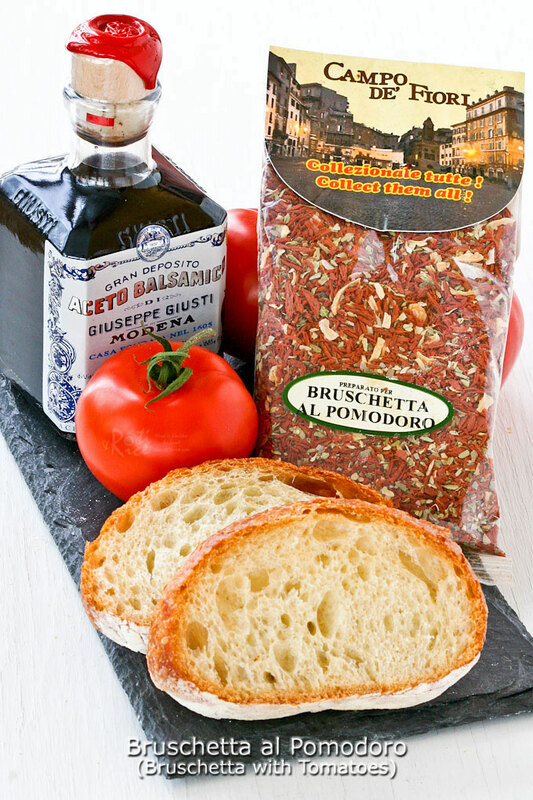 There is a simple recipe attached to the back of this Bruschetta al Pomodoro seasoning which sounded really good. I quickly went to the store for some ciabatta, juicy vine ripened tomatoes, a wedge of parmesan reggiano, and a bunch of Italian parsley. Although the latter two were not specified in the recipe, I thought it would be really pretty to add some additional color, flavor, and texture to the bruschetta. I was really happy with the way the bruschetta turned out. They were very tasty and pretty. Ro-Jiro who is a fan of Italian food said that they were really good and he would love to have more of it. I am glad to oblige as these are so simple to put together. You can probably make your own seasoning. Any combination of dehydrated tomatoes, garlic, oregano, onion, carrot, celery, and salt would work. Bruschetta al Pomodoro (Bruschetta with Tomatoes) - juicy vine ripened tomatoes, Italian parsley, and freshly shaved parmesan reggiano on ciabatta. Combine balsamic vinegar, olive oil, and seasoning in a shallow bowl. Add tomato slices, turning to coat with dressing. Toast ciabatta. Remove and drizzle with a little extra virgin olive oil on each slice. 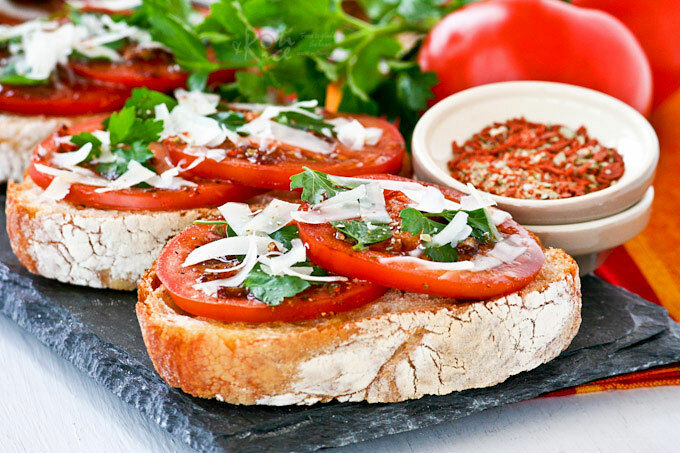 Place two slices of dressed tomatoes on each slice of ciabatta. 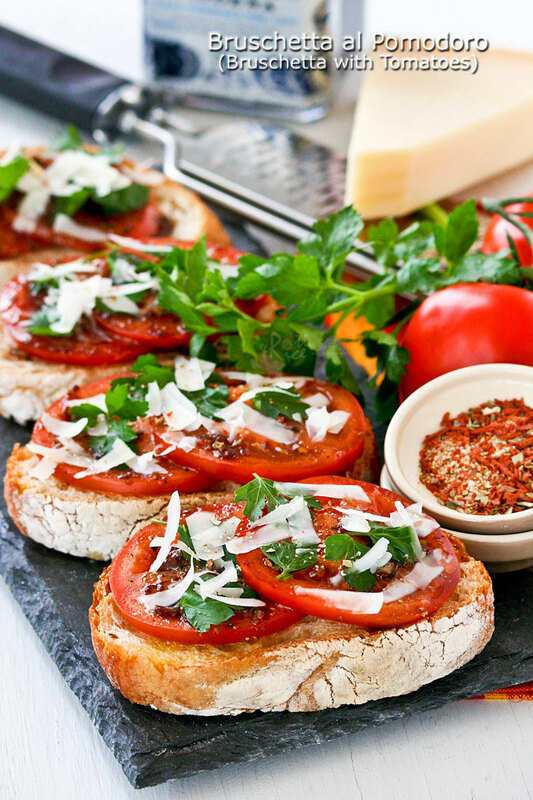 Grate pepper over tomatoes, sprinkle with Italian parsley, and shave parmesan on the top. Awesome pictures! What camera and lens do you use? These bruschettas look really fresh and gorgeous, Biren. Perfect with a glass of wine. Oh yes! A glass of wine is perfect with this appetizer. We had light and fruity Moscato and it was great! He definitely sounds like a keeper. 😀 And the dish looks absolutely delicious! Oh I can’t wait to find some great looking tomatoes like this! 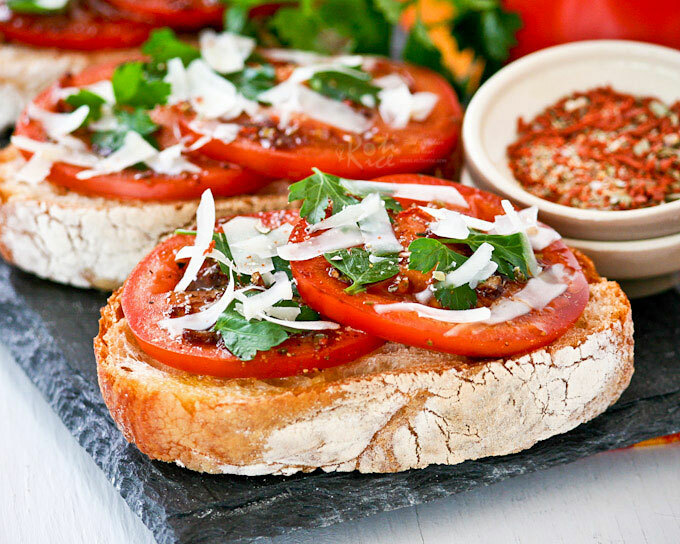 These bruschettas look delicious! I love eating lunches like this in the summer when I can get really fresh ingredients. Gorgeous! I absolutely agree with you. Those sweet heirloom tomatoes would be great for this! LKovely looking pictures. I always love an appetizing ciabatta dressed up in to a bruschetta. I would love to use the tart heirloom tomatoes and fresh mozarella but my hips never lie!!! I should start eating healthy like this! Too much rich food of recent:P Great looking bruschetta, I like the look of those slices of crusty bread. 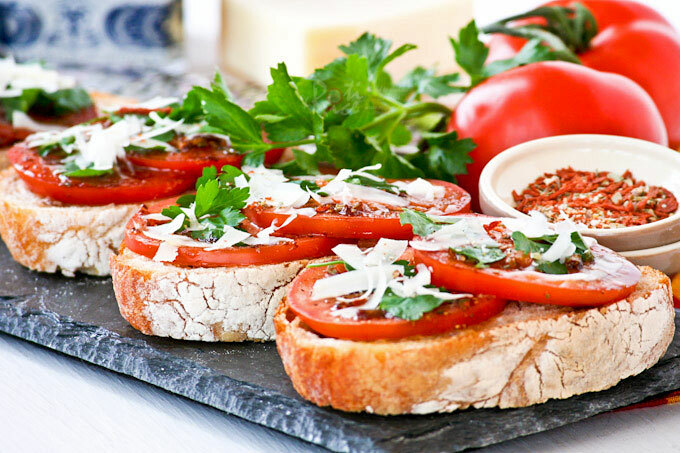 Great bruschetta! It’s a lovely offering – rustic and rich looking all at once. Fantastic photo. Best wishes! Thanks Denise! Always nice to have you visit. Best wishes to you too!